And I have to give it to Tarantino—he has great taste in actors. Christoph Waltz is currently one of my favorite people to watch on screen, and Tarantino is the reason I know who he is. The roles Waltz play always exude confidence and charisma, be they antagonist or protagonist. (He seems like he'd be a really awesome person to hang out with in real life, too.) The character of Dr. King Schultz is yet another awesome Waltz role. Schultz has a strong black and white view of life and he sticks to it throughout the movie, even when the outcome isn't positive. 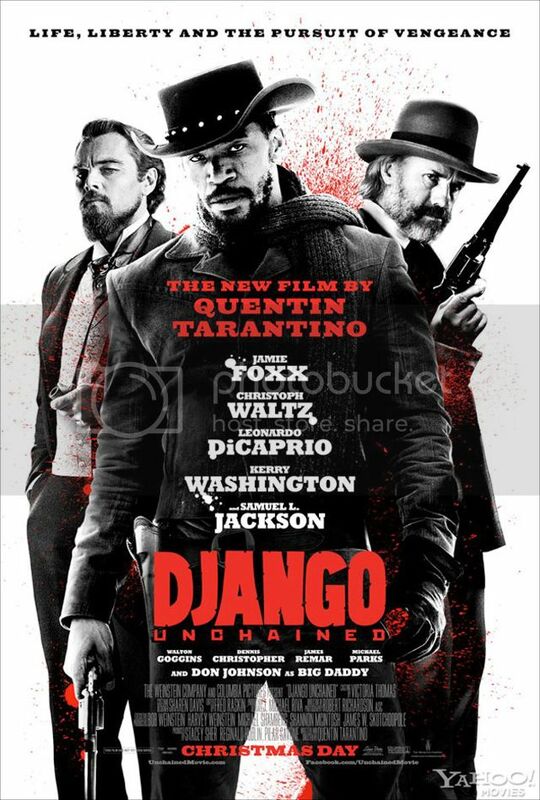 Foxx does an awesome job at slave-turned-bounty hunter Django, and Leonard DiCaprio is great at the big bad love-to-hate Monseiur Calvin Candie. The movie's not for the faint of heart (or stomach), but it's an entertaining ride for the rest of us. Christoph Waltz is consistently amazing...I love him and I must admit, without Tarantino I wouldn't know who he is either. I really really want to see this - thanks for the great review, I'm definitely going to make sure I see it now. This was a fantastic movie! I wasn't really a fan of Tarantino before Basterds, but I'm realizing I love him more and more. And Christoph Waltz is one of my new favorite actors, he is just so damn funny. I totally agree with you on the hard parts of that movie. In a copule of the scenes, I had to bury my face in my husbands shoulder. All in all, great movie! I need to go back and watch his older work. I might appreciate it better now. There were definitely times when I squeezed Colt's arm tight. While being a big fan of Tarantino, somehow I skipped 'Basterds.' I corrected that after watching Django...Twice. Christopher Waltz is an absolute delight! Basterds is awesome! I'm glad you went back and watched it. Even if he's an awful human being, Waltz's Hans Landa is one of my favorite characters of all time. The hardest part to watch for me was the 'Mandingo fight' in Candie's house. Holy crap was that visceral. Oh gosh, yes. That was awful. And to think that actually happened? Makes me sick to my stomach. I read a really interesting conversation between a critic and Tarantino that kind of changed the way I thought of Dr. King. It's a little more involved, but basically he explained how Dr. King is extremely egotistical and can't ever let anyone have the upper hand. That's why he takes out the sheriff in the beginning in such a convoluted way, why he comes up with such a ridiculous plan to save Broomhilda and why he can't just shake Candie's hand. Aw, boo. That makes me like his character less. I prefer that he's a man with a black and white view of what's right and wrong (with a little ego thrown in). But I can see how that would be the case, too. By the way I got Emily the blu-ray Tarantino collection for Christmas. We're going to revisit them all sometime soon. If there are any you'd like to (re)watch let us know. However, can you add Christoph Waltz into ALL THE MOVIES before I watch them? K, thx. As much as I enjoyed Django Unchained, there were quite a few parts that were really, really hard to watch. But so well done and memorable. Christoph Waltz wins the universe, in my opinion. Oh, totally. Like Enrique mentioned above—the Mandingo scene? Horrifying. And he totally wins the universe. I heart you for saying that.